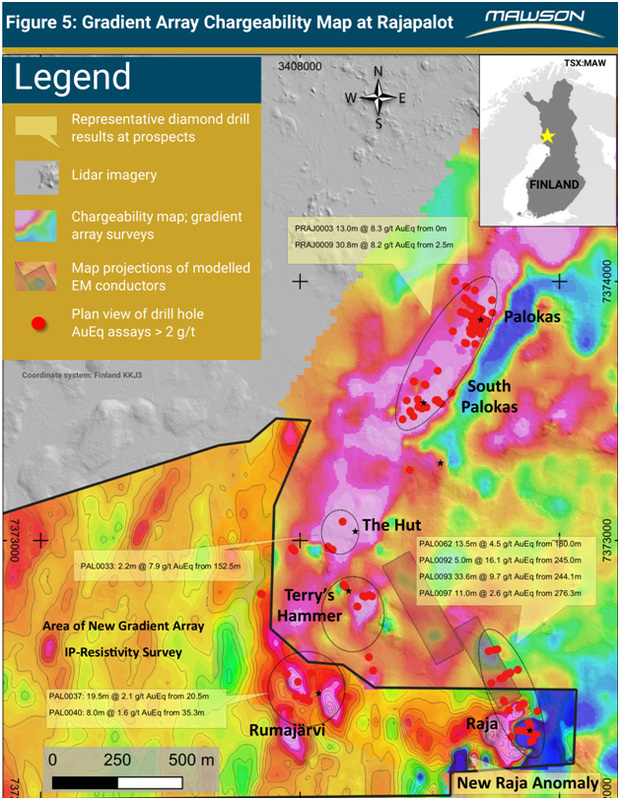 Vancouver, Canada – Mawson Resources Limited (“Mawson”) or (the “Company”) (TSX:MAW) (Frankfurt:MXR) (PINKSHEETS: MWSNF) announces promising electromagnetic survey results from the Raja prospect and updates the progress of geophysical surveys within the Company’s 100% owned gold-cobalt Rajapalot project in northern Finland. Multiple geophysical surveys are ongoing at the Rajapalot area with fixed-loop transient electromagnetic (“TEM”) designed to refine winter resource extension drilling and constrain airborne VTEMplus electromagnetic anomalies (“VTEM”); induced polarization (“IP”) to target new near-surface gold-cobalt mineralization (Figure 1); and mise-á-la-masse (“MALM”) to define mineralization in subcrop and demonstrate continuity of mineralized bodies. Electromagnetic techniques, first used in 2013 by Mawson at Rajapalot with a helicopter-borne VTEMplus survey indicated the conductive nature of areas subsequently discovered to be the Palokas, South Palokas, The Hut, Terry’s Hammer, Rumajärvi and Raja prospects (Figure 1). The broad scale of the line spacing (100 metres) and the low current induced in the ground from the VTEMplus survey requires follow-up with ground TEM surveys to accurately locate conductors to the accuracy of a drillable target. TEM surveys have already more than doubled the 450 metre long Raja prospect to greater than 1 kilometre down plunge. 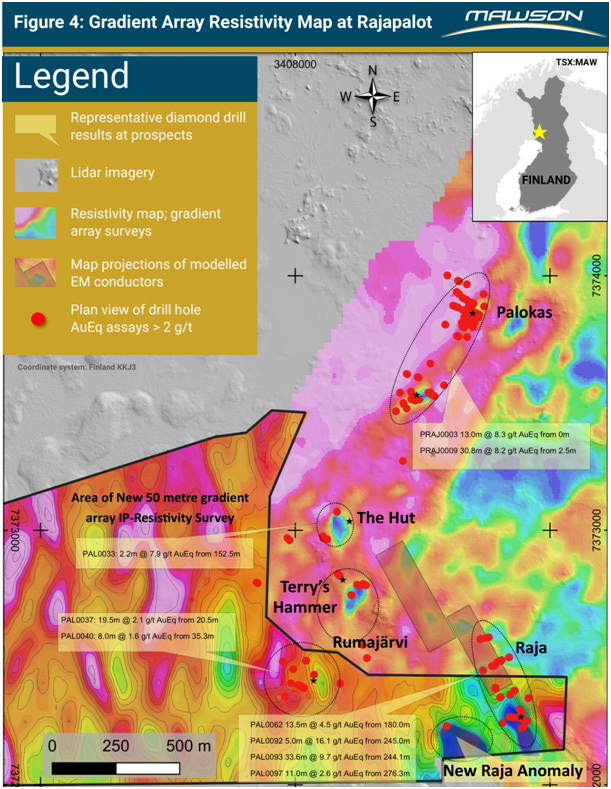 The Raja conductive body corresponds with known mineralization (including drillhole PAL0093: 33.6 metres @ 9.4 g/t Au Eq (“gold equivalent”), 8.0 g/t gold, 823 ppm cobalt from 243.0 metres), and then continues to at least 1 kilometre depth with increasing conductivity and remains open. It appears the northern extensions of Raja may coalesce with the Hut prospect VTEM conductor at depth. The complex nature of the resistivity and chargeability data obtained from the 50-metre line spacing on the gradient array survey is evident in Figures 4 and 5. So-called “negative IP” effects are clear with a low forming directly over the subsurface projection of the conductor – these effects are typically recorded in areas of multiple conductors and large contrasts in physical parameters. The strong target some 250 metres to the west of Raja lies within a fold hinge and displays the same complex chargeability and conductivity features of the Raja prospect. This target will be tested in the forthcoming drill program commencing in January 2019 (subject to final drill permitting). The IP-resistivity, electromagnetic and MALM surveys were conducted by two and three person teams from GeoVista AB (based in Luleå, Sweden). Line orientations for this program were matched with prior survey parameters. Post-collection processing and inversions of the data are completed by Dr Hans Thunehed of GeoVista AB. The gold equivalent (Au Eq) value was calculated using the following formula: Au Eq g/t = Au g/t + (Co_ppm/608) with assumed prices of Co $30/lb; and Au $1,200/oz. 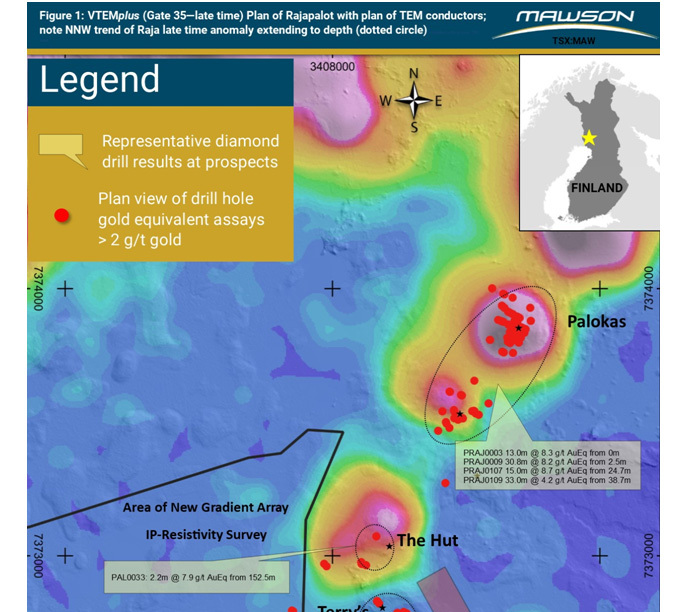 Mawson Resources Limitedis an exploration and development company. Mawson has distinguished itself as a leading Nordic Arctic exploration company with a focus on the flagship Rajapalot gold-cobalt project in Finland. 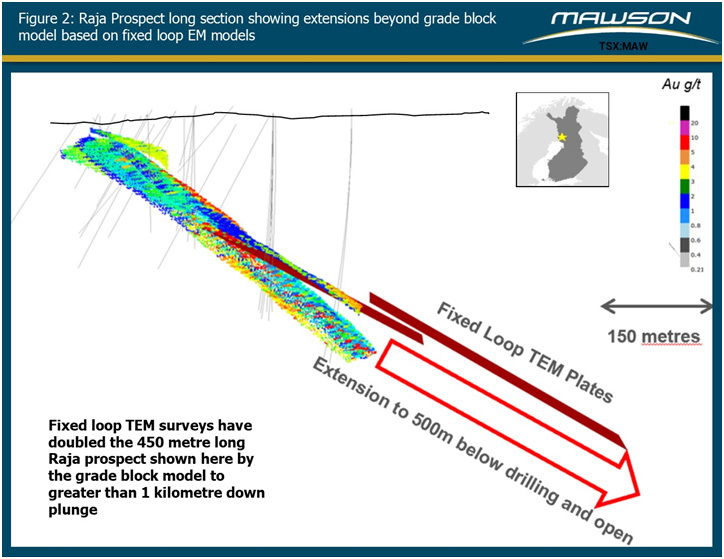 Figure 3: Plan view of mise-á-la-masse (“MALM”) surveys at the Raja prospect have defined subcropping mineralization and support the north-west extensions seen in the TEM surveying. 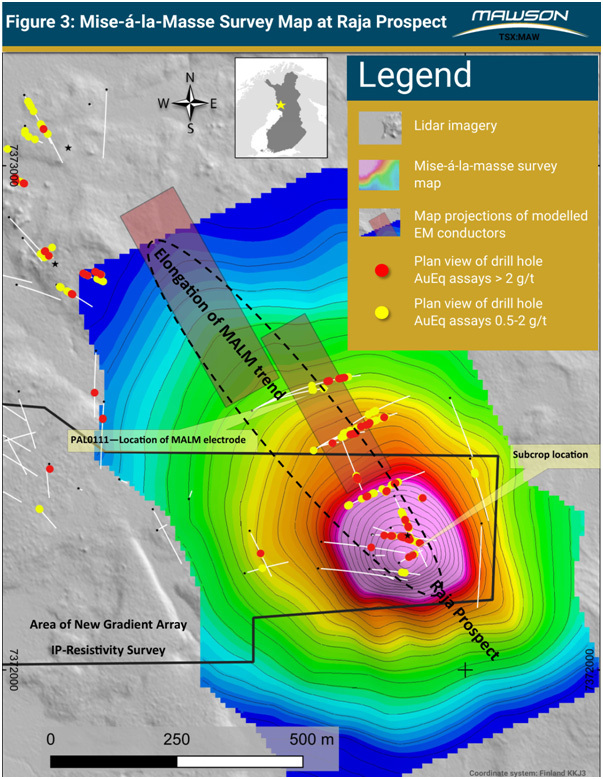 This survey demonstrates mineralization is a coherent body along the drilled 450 metre strike length.